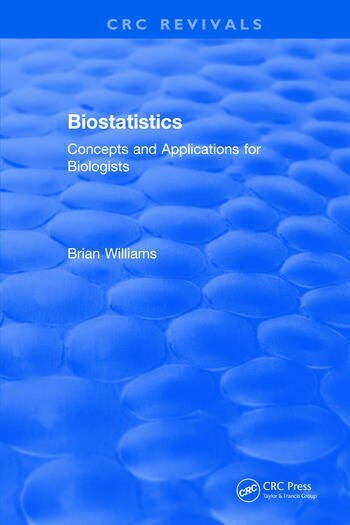 This book is a first course in statistics for students of biology. Most of the examples have an ecological bias, but illustrate principles which have direct relevance for biologists doing laboratory work. The structured approach begins with basic concepts, and progresses towards an appreciation of the needs and use of analysis of variance and regression, and includes the use of computer statistical packages. The work is clearly explained with worked examples of real-life biological problems, and should be suitable for undergraduate students engaged in quantitative biological work. Biostatistics should give students a sound grasp of the key principles of biological statistics without overwhelming detail, and should allow students to quickly apply techniques to their own work and data. This book is a first course in statistics for students of biology. Most of the examples have an ecological bias, but illustrate principles which have direct relevance for biologists doing laboratory work. The structured approach begins with basic concepts, and progresses towards an appreciation of the needs and use of analysis of variance and regression, and includes the use of computer statistical packages. "This book is intended as a first courst in statistics for biology students. Topics convered include probability, distributions, hypothesis testing, comparisons, analysis of variance and regression."